Dig hole for tanks and trench for incoming 110mmØ PVC pipe. Allow for 100mm minimum fine gravel bedding to level up bottom of hole to receive the two tanks. 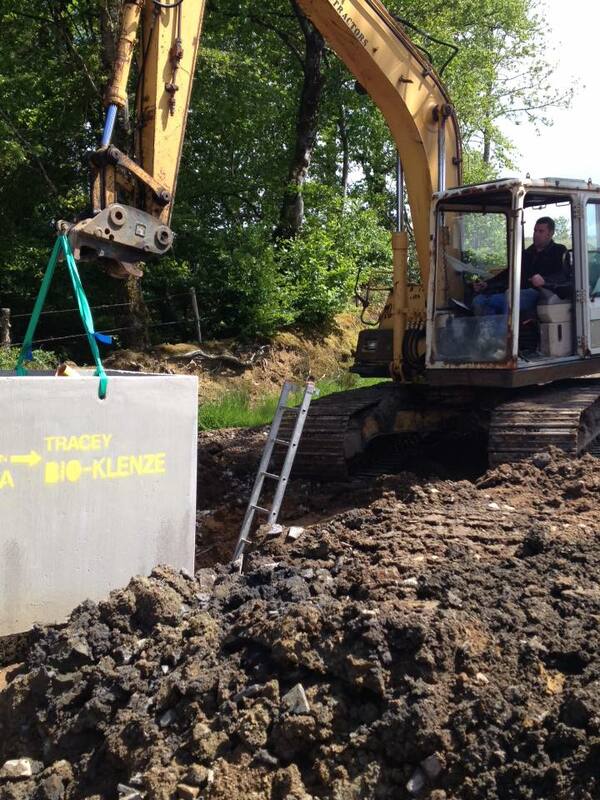 Backfill with soil removed from the hole removing any large boulders this allows safe access to the tanks. Fit and grout the inlet/outlet and adjoining PVC pipes into the correct positions. A permanent shutter template is provided for each position and can be left in position. Place concrete lid on Primary Settlement tank, followed by concrete lid on Biological/Settlement tank. The PVC risers and lids fit into the access holes in the concrete lid. As you place PVC riser containing compressor between the other risers, pull the air hose up through the hole in the concrete lid and connect into compressor unit. Also ensure the electric feed wire to connect the waterproof socket enters the bottom of this PVC riser. Finish backfilling, when all connections are complete the Bio-Klenze unit is ready to operate when water is added.